Chuck Pagano is the new Indianapolis Colts head coach. Pagano has been on the Baltimore Ravens staff as Secondary Coach and Defensive Coordinator since 2008. He also coached at USC, Miami, Boise State, East Carolina, UNLV, North Carolina, the Browns and Raiders. Pagano served as the Cleveland Browns Secondary Coach from 2001-2004. 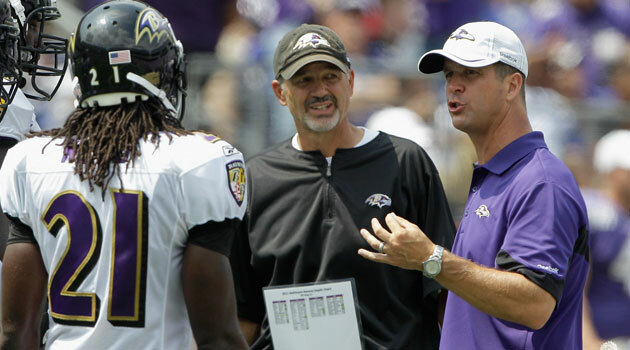 He was the Defensive Coordinator for the Ravens in 2011. Alshon Jeffery had 4 catches for 148 yards and a touchdown in the Gamecocks win. 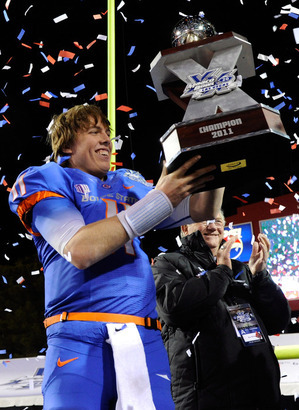 Kellen Moore threw for 293 yards and 2 touchdowns in his final game as a Bronco. Tyler Wilson threw for 216 yards and 2 touchdowns in a win over the Wildcats. LaMichael James ran for 159 yards and a touchdown in his final game as a Duck. Justin Blackmon had 8 catches for 186 yards and 3 touchdowns as the Cowboys took down the Cardinals in overtime. 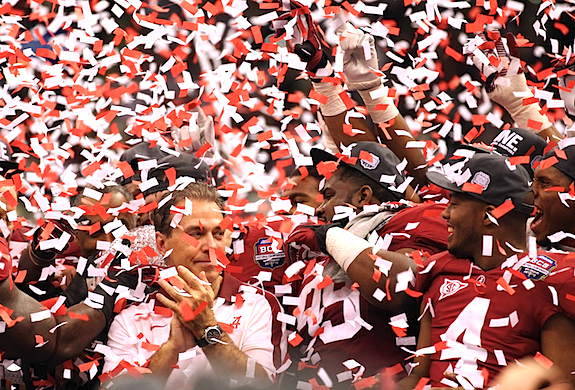 Nick Saban and the Crimson Tide dominated the Tigers to win the BCS National Championship. LaMichael James ran for 219 yards and 3 touchdowns as Oregon won the Pac 12 Championship. Montee Ball ran for 137 yards and 3 touchdowns as Wisconsin won the Big Ten title. Kellen Moore threw for 313 yards and 3 touchdowns as the Broncos destroyed the Lobos. Austin Davis threw for 279 yards and 4 touchdowns, as they ruined the perfect season for Houston and won the Conference USA title. 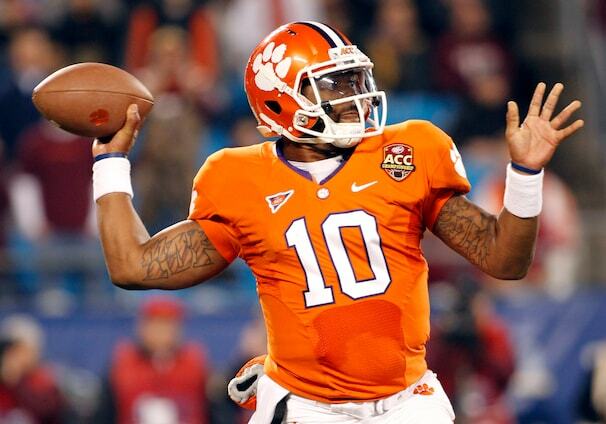 Tajh Boyd threw for 240 yards and 3 touchdowns as the Tigers won the ACC title. Joseph Randle ran for 151 yards and 2 touchdowns as the Cowboys beat the Sooners for the Big 12 title. Kenny Hilliard ran for 72 yards and 2 touchdowns and also caught a 8-yard touchdown pass as the Tigers won the SEC title. Colter threw for 115 yards and a touchdown in the upset. 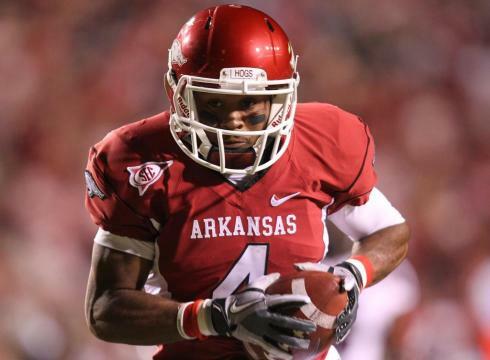 Wright's two touchdowns helped the Hogs pull out a close one. Broyles had 2 catches for 87 yards before tearing his ACL. Tyler Shoemaker had 102 yards and 2 touchdowns in the win. Luck threw for 206 yards and 3 touchdowns. 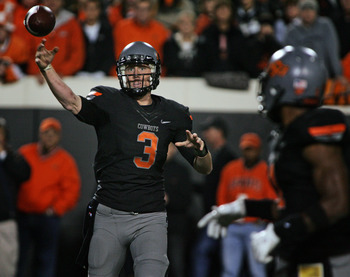 Weeden threw for a school record 502 yards and 4 touchdowns. Drew Alleman's 3 field goals were the difference for the Tigers. The Commodores had the Razorbacks very worried in the first half. Jordan Rodgers, little brother of Aaron Rodgers, ran for 2 touchdowns and threw for another as Vanderbilt had a 21-14 halftime lead. The Hogs special teams and defense took over in the second half, behind a 94-yard fumble return and 3 Zach Hocker field goals, including a 42-yarder to win it. Tyler Wilson threw for 316 yards and a touchdown and Jarius Wright had 10 catches for 135 yards and a touchdown in the win. Arkansas hosts South Carolina this week. Hocker's 42-yarder won it for the Hogs. The undefeated Wildcats welcomed a very angry Sooner squad to the “Little Apple”. Kansas State got within a field goal early in the second, but was never close the rest of the game. Landry Jones shredded the Wildcat secondary for 505 yards and 5 touchdowns. His favorite target, Ryan Broyles had 14 catches for 171 yards and a touchdown. Oklahoma hosts Texas A&M next. Jones threw for 505 yards and 5 touchdowns in the win. The Ducks got Darron Thomas and LaMichael James back as they battled the Cougars. Thomas threw for 153 yards and a touchdown and James ran for 53 yards, in a backup role to Barner. For another week, the Ducks offense revolved around Kenjon Barner, who ran for 107 yards and a touchdown. The most impressive part of Oregon’s 43 points is they only had the ball for 19 minutes the whole game. The Ducks travel to Seattle to take on Washington. Barner was the focal point of the Ducks offense again. Fans in The Coliseum were treated to a Pac 12 classic. The Trojans and Cardinals played through three overtimes to find a winner. The scoring fest didn’t get going until the second half, when USC’s Curtis McNeal, who ran for 145 yards, scored touchdowns on two consecutive possessions to put the Trojans up 20-10. 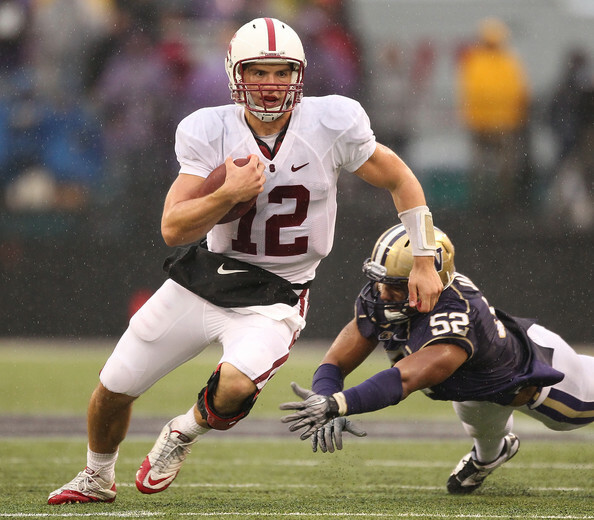 Andrew Luck responded with a 5-yard pass and a 2-yard run to put Stanford up 24-20 after three. The game was tied at 27 with 3:08 to play, when Luck was intercepted for a 33-yard return to put the Trojans up 34-27. The Cardinals drove down to the USC 2-yard line, where Stephan Taylor scored with 38 seconds. USC drove down the field but came up short on a controversial play where the Trojans believed there was time left, but officials ruled the game was headed for overtime. Both teams went back and forth in the first two overtimes, as Stanford got the ball first in the third overtime. Stanford scored on a Taylor 5-yard run and completed the two point conversion with a Luck pass to Tight End Coby Fleener. USC hoped to respond but Curtis McNeal fumbled the ball into the end zone for a touch back, giving the Cardinals the dramatic win. The Cardinals travel to Corvallis to take on Oregon State. It was a bad trip to Atlanta for the unbeaten Tigers. The Yellow Jackets took it to Clemson from the start behind two touchdowns runs from Orwin Smith, giving Georgia Tech a 24-3 halftime lead. Tahj Boyd attempted to lead a comeback in the second half with a 48-yard pass to Freshman sensation Sammy Watkins, but still would only be able to get within two scores. The Tigers have the week off before hosting Wake Forest. Washington's 176 yards rushing and 60 yards passing led to the upset. The Bears had no answer for the Cowboys offensive assault. Oklahoma State attacked on the ground and through the air to the tune of 600 yards of total offense. Joseph Randle ran for 152 yards and 4 touchdowns as they continue to have a balanced offense. The aerial combo of Weeden and Blackmon was successful as well, as Weeden threw for 274 yards and 3 touchdowns and Blackmon had 13 catches for 172 yards and 2 touchdowns. The Cowboys welcome Kansas State to Stillwater this week. Randle found pay dirt 4 times against the Bears. No LaMichael James and Darron Thomas, no problem. The Buffaloes had no answer for the Ducks in this blowout. Oregon scored on all 4 of their first quarter drives including two by Kenjon Barner. Barner ran for 115 yards and Bryan Bennett threw for 156 yards and 2 touchdowns in place of Thomas. The Ducks host Washington State this week. The Rebels gave the Razorbacks all they had in a tight SEC match up. Ole Miss jumped out to a 17-0 lead midway through the first half, before Arkansas got on the board to make it 17-7 at the half. The second half belonged to the Hogs as they outscored Ole Miss 22-7. Tyler Wilson threw for 232 yards and ran for 2 touchdowns. On the ground, Dennis Johnson ran for 160 yards and a touchdown. Arkansas travels to Nashville to take on Vanderbilt. Wilson threw for 232 yards and ran for two scores. The Huskies who were one of the surprising stories, had their “Luck” run out this weekend. Andrew Luck threw for 169 yards and 2 touchdowns. The Cardinals ground game of Stepfan Taylor and Tyler Gaffney ran for 255 yards and two touchdowns, taking some pressure off Luck. Stanford travels to the Coliseum to take on USC. Luck only threw for 169 yards but found the end zone twice. 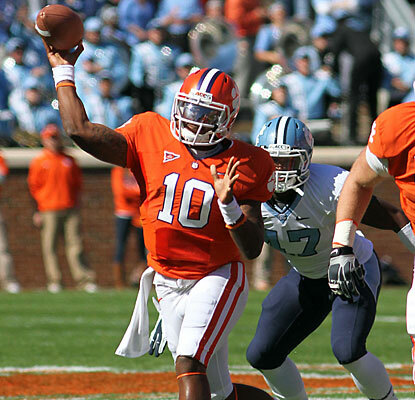 The Tar Heels players will probably see Tajh Boyd in their nightmares for weeks. Boyd threw for 367 yards and 5 touchdowns and ran for a touchdown as well. Freshman sensation Sammy Watkins continues to attract Boyd’s attention, catching 8 balls for 91 yards and a touchdown. The Tigers travel to Georgia Tech this week. Boyd continues to lead the fighting Dabo's. This was a Big Ten affair that people will be talking about for years. Wisconsin scored twice in the first and the Spartans responded with 23 answered points to take a 23-14 halftime lead. The only score in the 3rd was a 23-yard field goal, which led to a frantic fourth quarter. The Spartans scored first on a 15-yard pass from Kirk Cousins, but Wisconsin answered back with two scores to tie it at 31 with 1:30 left in the game. 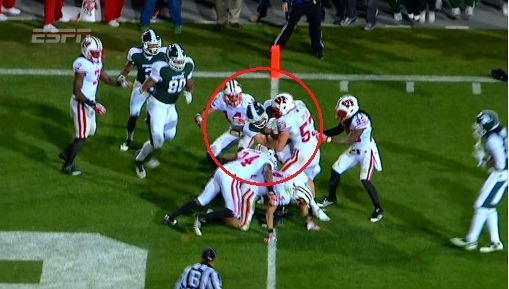 Michigan State drove down to the Wisconsin 44 and had one play left until overtime. Kirk Cousins rolled around and fired a ball down to the goal line where it was tipped and landed in the hands of Keith Nichol. He was ruled down at the 1-yard line, but officials then reviewed the play and ruled he broke the plane for a touchdown, giving Michigan State the win. This week, Michigan State travels to Nebraska and Wisconsin travels to Ohio State. Nichol hauls in the hail mary from Cousins to upset Wisconsin. The Falcons gave the Broncos one of their toughest tests of the year. Air Force was in the game until late in the fourth, when Kellen Moore hit Doug Martin with a 2-yard pass to put them up 34-20. Moore threw for 281 yards and 3 touchdowns and Martin ran for 125 yards and a touchdown in the victory. Boise State has the week off before traveling to Las Vegas to play UNLV. Moore threw for 281 yards and 3 touchdowns. The Cowboys offense that normally dominates through the air, kept it on the ground for the most part. Joseph Randle ran for 138 yards and 3 touchdowns and caught a touchdown. Brandon Weeden was decent throwing for 338 yards and 3 touchdowns in the win. The bad news was Justin Blackmon was held out of the second half after sustaining a head injury. Oklahoma State hosts Baylor this week. Randle ran for 138 yards and 3 touchdowns. After an hour and 45 minute weather delay, the Red Raiders took it to the Sooners. The Norman faithful were speechless as Texas Tech took a 24-7 halftime lead. Oklahoma surged back in to second half behind Landry Jones’s 412 yards and 4 of his 5 touchdowns. The Sooners got within a field goal but could not recover the onside kick, which sealed the upset for Texas Tech. The Sooners travel to Kansas State for a Big 12 battle this weekend. Doege threw for 441 yards and 4 touchdowns in the upset of the Sooners. The Trent Richardson Show had many “Volunteers” this week. Richardson ran for 77 yards and 2 touchdowns in a one-sided affair. The passing game was good too, with A.J. McCarron throwing for 284 yards and a touchdown and Marquis Maze had five catches for 106 yards. 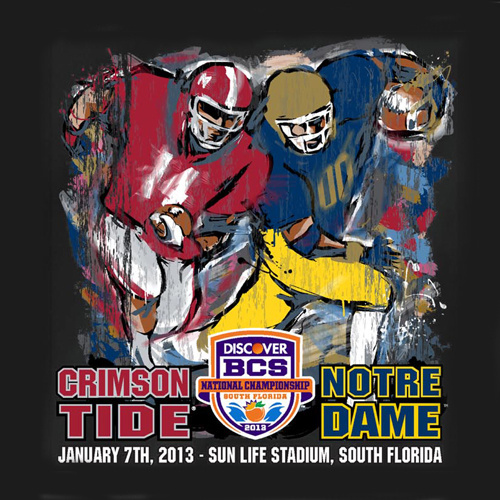 The Crimson Tide have a week to prepare before hosting LSU in the biggest game of the season. Richardson found the end zone twice against the Vols. The battle of the Tigers was easily won by the team from Baton Rouge. Through the air, Jarrett Lee threw for 165 yards and 2 touchdowns and on the ground, Kenny Hilliard ran for 65 yards and 2 touchdowns. Jordan Jefferson came off the bench to throw a 42-yard touchdown pass that proved to be the game winner. LSU has their bye week before traveling to Tuscaloosa for a game people have been looking forward to all season. Jefferson's 42-yard touchdown pass proved to be the game winner.